I came across Ana (oceanida) when I visited the R&D Gallery at Diotima (see here). Ana (oceanida) makes photographs in black and white. She plays with coloured transparent walls and with mirror effects that provide another and particular view at her work. 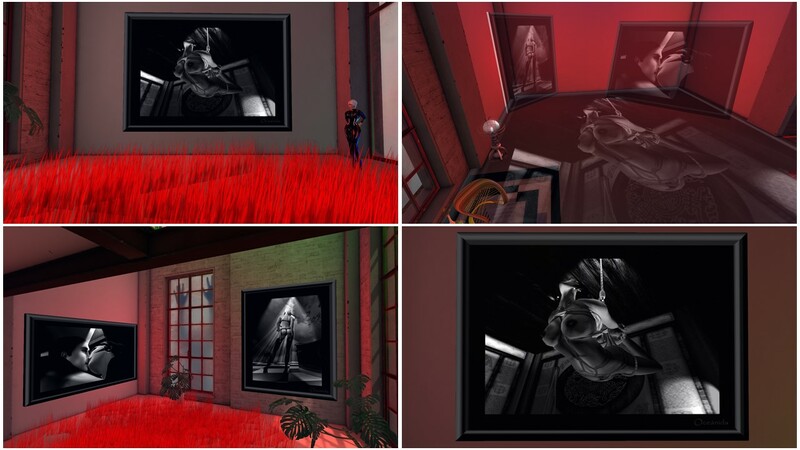 Today, when I was looking where to go to for simploring, I saw on scoop.it SL Destinations, that there’s another exhibition of Ana called “The 7 deadly sins”, which is presented at the Niflheimer Art Gallery. The Niflheimer Art Gallery, owned by Thor (anaadi), is located in an old plant building. The Gallery is curated by Yvan Slade. The old plant building is quite popular in Second Life and I saw it quite often already before used for different purposes. Ana’s exhibition “The 7 deadly sins” presents her black and white pictures again using coloured transparent walls as well as mirror and light effects. In addition Ana added furniture and other objects to enhance the effect of her pictures. The seven deadly sins, also known as the capital vices or cardinal sins, is a grouping and classification of vices within Christian teachings. Behaviours or habits are classified under this category if they directly give birth to other immoralities. The standard list compromises pride, greed, lust, envy, gluttony, wrath and sloth, which are also contrary to the seven virtues prudence, justice, temperance, courage (or fortitude), faith, hope and charity. (source wikipedia). Ana grouped her pictures according to the 7 deadly sins. 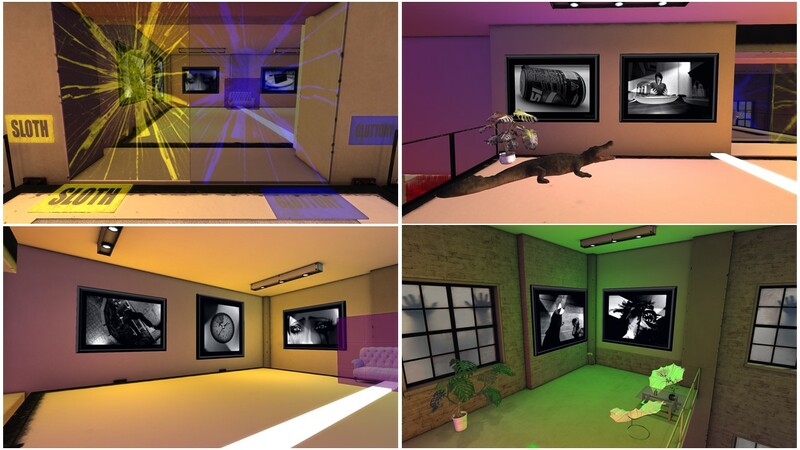 You enter the different rooms through transparent walls and the room, the pictures on the walls and all other objects are submerged by this colour. Most of the pictures do clearly represent the according deadly sin. I just had problems to interpret 2 of the 3 pictures related to the sin of sloth. During my visit I was dressed in a black latex catsuit and wearing a corset and I fitted quite well into the surrounding, particular in the space dedicated to the deadly sin of lust. Overall “The 7 deadly sins” is a felicitous exhibition. 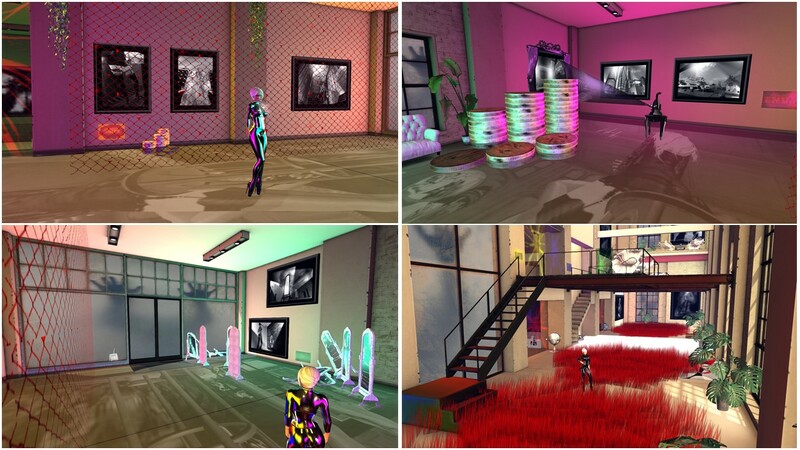 Ana’s pictures are very expressive and the colourful environment once again provides a great contrast, something you can’t easily reproduce in the physical world. The exhibtion was opened August 5th and I don’t know how long it will be shown at the Niflheimer Art Gallery, so you should better visit it timely. Thank you Ana for the great work and thank you Thor for providing the space for the art.